BlizzCon 2016 was an exciting whirlwind of previews and reveals for all Blizzard titles. We hope you enjoyed the celebration of all things Blizzard as much as we did! Starting December 1, 2016 through the end of the year, 100% of the proceeds for this fel kitten will be donated to the Make-A-Wish Foundation, a non-profit charity. We hope Mischief will be gift-able. What better way to celebrate the upcoming holiday season and support a worthy cause, than to share an adorable pet with friends and family? During the 'World of Warcraft - What's Next' panel Blizzard announced that the Brawler's Guild will be making a return in Patch 7.1.5 (release date not yet announced). Previously, collectors had to reach Rank 4 in the Brawler's Guild to unlock Clock'em. 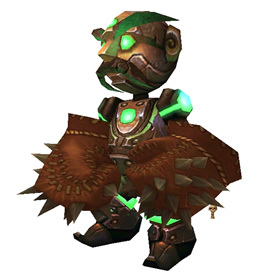 We hope that this battle pet will also be returning with the reopening of the guild. If you haven't collected Clock'em yet, keep an eye out for Patch 7.1.5 announcements! Last but not least, Blizzard dropped a massive teaser of what's to come in Pet Battles. No additional information was provided, nor an estimated release date for this new content. For now, we can only speculate as to what a dungeon of this nature will entail. Keep in mind that although this concept was mentioned at BlizzCon, it's likely still a work in progress and is not guaranteed to be released. Still, we can't wait to learn more about Pet Battle Dungeons! We'd like to thank Marzena for once again organizing and hosting this year's WarcraftPets Community Meet-Up! We're still in the process of winding down from the convention and gathering all of the wonderful BlizzCon Meet-Up pictures, so stay tuned. Keep an eye on the WarcraftPets Facebook page; we'll be adding a BlizzCon 2016 photo album in the near future. Or could we simply be getting more pets like the Dream Whelpling found at the end of the Emerald Nightmare raid? In other words, placing pet battles or even battle masters in dungeons. This works as long as they are at the end of the dungeon or raid. It can't be expected for a group to wait in the middle of a run for you to do a pet battle. I would rather have something where there are tons of battles, but not all hard. I don't like how difficult the celestial pet tournament was. I'm hoping for fun over difficulty in this dungeon. Anything for other types of collectors, like battle pets? For pets, an artist has an idea and some extra time, then builds something and says “hey, want to use this?” so there is a library stacked up of awesome unused pets for the right opportunity.